Our Tiny Toddler Room caters for children between the ages of 1.5 and 2.5 years. We focus on providing a stimulating environment for the children and assist in the development of basic self-help skills such as washing and drying hands, self feeding, putting hats on and assisting educators to pack up toys after play. Our educators also use a range of strategies to assist children in developing their communication skills and encourage them to express their feelings in appropriate ways. We encourage children to be independent but remain close at hand for a comforting cuddle or to offer verbal reassurance when children require it. Achievements such as birthdays, arrival of siblings and mastery of new skills are celebrated with huge fanfare to develop children’s confidence. A happy atmosphere is maintained throughout the day with lots of singing and dancing to stimulate children’s imagination and creativity. Children are given opportunities and encouraged to develop their fine motor skills through creative mediums such as painting, collage, drawing and sensory play activities including play-dough and slime. The program also focuses on the development of children’s gross motor skills such as running, digging, jumping, throwing and catching. 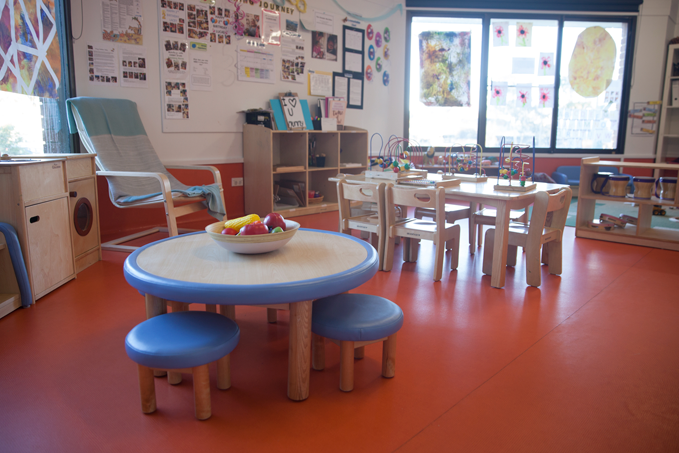 Children in the Tiny Toddler Room access the main outdoor space, which includes garden beds, play equipment, a large sandpit, sporting equipment, bikes and a bike path.